“Stand up straight!” We have all heard this at some point in our lives. And while the intention of encouraging proper spinal alignment is good, our spines are actually not straight, nor should they ever be to properly balance us through day-to-day activity and to support our muscles and organs. 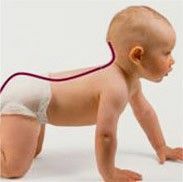 A properly developed spine is actually shaped like an elongated S. The first year of life and the movement experiences you provide your baby are key to the proper spinal development. 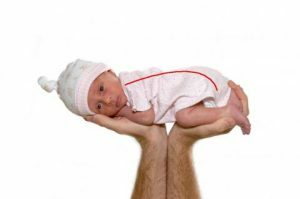 When your baby is first born, his/her spine will have a convex curve in the shape of the letter C. Your newborn does not yet have the muscle strength to hold up his head and needs to be carried carefully with his head and neck fully supported. You will also notice your newborn will tuck his/her legs into a frog leg position, thighs pulling up toward the chest, while laying on her belly or when you pick her up. This fetal tuck allows your baby to maintain her primary curve alignment, reducing the pressure on the spine and hips. 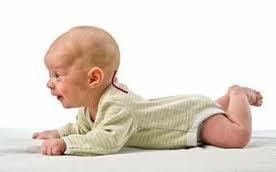 Over the first few months after birth your baby will begin to interact with the world around him. He will lift his head to look around, engage with you, or turn to the direction of noise or light that catches his attention. 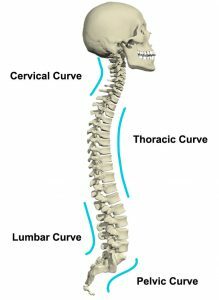 As your baby moves through these experiences, he is developing the muscles in his neck and developing the secondary curve of his upper spine, the cervical curve. The best way to encourage your baby’s cervical curve is to give her plenty of tummy time. Arching her neck against the pull of gravity will strengthen her neck muscles. But don’t forget your baby is a social creature who does not enjoy being without you for a long period of time. While a toy, mirror, or other object may provide a few minutes of entertainment in tummy time, after a while your baby will grow tired of being without you and likely show her dissatisfaction by fussing and crying so get down on the floor on your tummy facing her or lay on your side beside her, so she knows you are close by and ready to engage her. Aim for a minimum of 30 minutes of tummy time daily. This can happen in 5-10 minute intervals throughout the day. Avoid the urge to rush your baby through any stage of her spinal development. Placing her in containers or toys that impede her movement, or placing her in a position she cannot support on her own can delay your baby’s development or create long term spinal issues. Spending too much time in a container on his back can cause issues with your baby’s spinal development. Swings, bouncy seats, and even strollers keep baby in the C curve position, so the cervical and lumbar spine do not have the opportunity to develop. Without tummy time, he cannot exercise his muscles to provide him with the strength he needs to move through important milestones, such as rolling, sitting and crawling. While these containers can provide your baby with a safe place to lay while you tend to other day-to-day tasks, avoid overusing them and try to balance this time spent in them with the same amount of tummy time. When your baby is placed in a sitting position before she is ready, this puts the entire weight of her head on her spine. When the spine and surrounding muscles have not developed the strength to properly support this weight, it can lead to the risk of spinal degeneration or issues with the surrounding organs. Toys such as exersaucers, jumpers, or baby seats should not be used until your baby can sit on her own. Even once your baby is able to self-support a seated position, these toys should be used in moderation, as she does not have the freedom to move. Your baby still has many other muscles and movements she needs to develop on her tummy to help promote crawling and eventually walking. The 4 Pillars of Living Longer!